The raw food hypocrite should be on top of the latest raw food foods and trends but I have to admit I only stumbled across Chia seeds (also known as Salvia hispanica) in an obscure health food shop in Melbourne. At first I had a tablespoon with my breakfast a few times a week, however since I’ve been so super busy the last few months, I’ve been eating badly, forgetting my healthy extras, feeling particularly dehydrated and hence retaining water and swelling to the size of blimp. With busy-ness down a notch, I’ve stopped coffee, upped my coconut water (and water) and dandelion tea (good for liver and gall bladder and water retention), added chia seeds back in and voila, I already feel much, much better. According to Living Foods – For centuries this tiny little seed was used as a staple food by the Indians of the south west and Mexico. Known as the running food, its use as a high energy endurance food has been recorded as far back as the ancient Aztecs. It was said the Aztec warriors subsisted on the Chia seed during the conquests. The Indians of the south west would eat as little as a teaspoon full when going on a 24hr. forced march. Indians running form the Colorado River to the California coast to trade turquoise for seashells would only bring the Chia seed for their nourishment. When a chia seed is exposed to water, it forms a coating of gel, increasing its size and weight to nine times its original form. Since the gel is made of water, it has no calories and also fills you up to prevent cravings. Both the gelling action of the seed, and its unique combination of soluble and insoluble fiber combine to slow down conversion of starches into sugars. This means if you eat chia with a meal, it will help you turn your food into constant, steady energy rather than a series of ups and downs that wear you out. The exterior of the seed is protected by insoluble fiber that keeps food moving smoothly through the digestive process. Soluble fiber and the gel coating of the seed also keep the colon well-hydrated. By weight, chia contains more omega 3 than salmon, and yet it doesn’t taste remotely like salmon. Omega 3 oil is important in heart and cholesterol health and a sensational source for vegetarians and rawists. Chia is extremely high in anti-oxidants, which makes the Chia Seed stay fresh and ready to eat for over two whole years! And that’s all without a single chemical or preservative. This amazing ability is not found in other seeds like flax or sesame, because those seeds don’t have the same rich anti-oxidant content. One of the exceptional qualities of the Chia seed is its hydrophilic properties, having the ability to absorb more than 12 times its weight in water. This prolongs hydration in the body, keeping skin and cells inside and out looking plump, supple and great. 1. In a june 2009 study, results showed the serum levels of plant-based omega-3 fats (alpha linolenic acid) increased by 24% in the chia seed group (vs control). This is considered a positive finding and indicates some degree of absorption of the healthy fats contained within the seeds, however according to the study no other direct benefits were noted. 2. A scientific trial completed in 2009 examined the effect of chia seeds on appetite and blood sugar levels. The authors of this study found that the middle (15 grams) and highest dosages (24 grams) resulted in blood glucose reductions of between 33-44%. 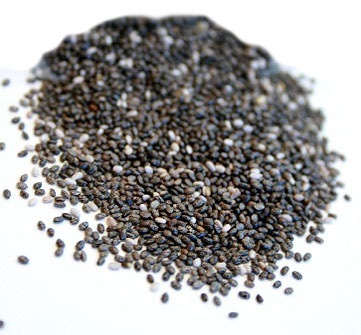 The “intermediate dose” of chia also prompted a 47% drop in hunger levels. 3. In a longer-term experiment published in November 2007 in the journal Diabetes Care results showed – while undergoing the chia diet there was a significant reduction in C-reactive protein (an inflammatory marker), improvements in blood sugar control (A1C) and circulatory factors (fibrinogen) and a drop in systolic blood pressure. It’s absolutely in my daily regime and I can absolutely vouch for the benefits of this ancient superfood – although I can suggest rinsing your teeth before rushing out the door as they stick around and make you look as though you desperately need a visit to the dentist…I recommend buying them from my friend Rob at funkyraw – only £18 for a 1 kilo is a bargain.